I have been showing, breeding and enjoying the Cat Fancy since 1995. 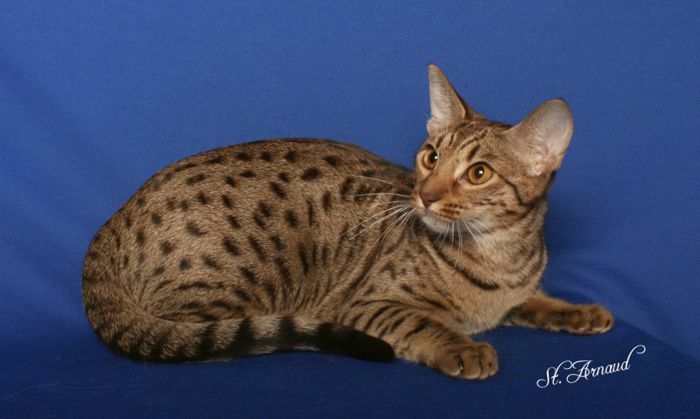 During that time, I have continuously worked towards the promotion and preservation of the wonderful breed known as the Ocicat. I have met many fabulous people and have worked with many different lines in creating my show cats. I acquired my first pair of Ocicats from Victoria Garvin/Sherry and Shannon Campbell of Moirai. When Victoria saw how one of my kittens was growing up, she encouraged me to try showing. He granded quickly, and I was hooked. I returned to Victoria, Sherry and Shannon for my first breeding cat, and had a grand in my first litter. 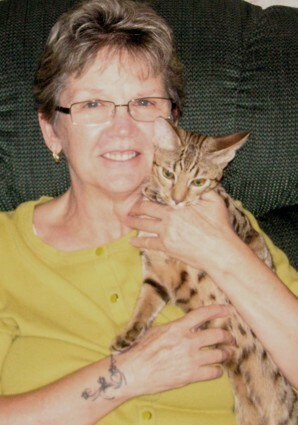 Although my life has been busy, I have continued to show Ocicats, even granding some unusual colors, like GC Ocipaws Charleston Chews, ebony silver and GC Ocipaws Dugan Brit, blue silver. My most recent grand is GC Ocipaws Just Chillin' Out Pudder Tat, a beautiful chocolate female (shown at the top of the page). I believe the Breed Council Secretary is a liaison between CFA and those most interested in the Ocicat, the members of the Breed Council. In my opinion, that person should be focused, persistent, detail-oriented, and absolutely committed to the breed. Since it is our mission as Breed Council members to preserve our breed, the Breed Council Secretary needs to be able to compile the ideas generated by the Breed Council and see them to fruition. It is the secretary's responsibility to be clear, concise and objective in presenting information to CFA, and to defend the Ocicat. It is also the secretary's responsibility to acquire and provide information from CFA and the CFA Board of Directors to the Breed Council members. I am retired, but worked 22 years in communications for DoD (Army, Navy, Air Force). I worked as the liaison between these DoD agencies and FCC, FAA and the National Telecommunications and Information Agency. (NTIA) Attention to detail, both listening and expressing ideas was critical to the mission. In other words, I am an experienced communicator that can professionally present our ideas to CFA, and in turn communicate the needs of CFA to us as Breed Council members. The Ocicat is at a turning point within CFA. Without new interest in our wonderful breed we may slowly cease to exist. 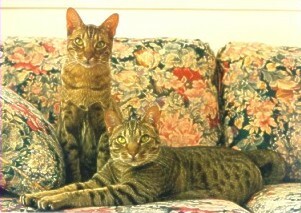 I am committed to the Ocicat - the best breed there is! It is time to focus on promoting our unique, wild looking but all domestic breed. I will do my best. Please contact me with your suggestions, questions or concerns.